What is a Garage Makeover? Many people just hate walking into their garage. It looks like a place they wouldn’t want to spend any time in, and it’s cluttered with tools and gardening supplies. It also holds boxes of various sizes and shapes, and in different stages of deterioration. It’s almost impossible to find anything the boxes are supposedly keeping organized. 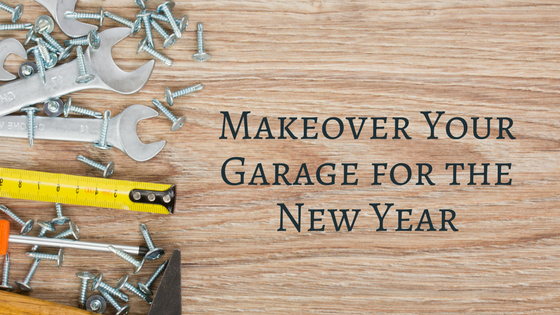 Imagine what it would be like if the right makeover turned your garage into a clean, good-looking and organized space. You could use it as the headquarters for completing projects around the house, and you could easily find the holiday decorations next year without several trips between the garage and the attic. Imagine being able to find all the tools and accessories you need to complete any type of project. You could even have a place to work on those projects without the need to remove all the boxes from the workbench the previous homeowner made from scrap lumber. Further, imagine if the floor of the garage had a garage floor coating that made it easy to keep clean and avoided tracking cement dust into the house. That’s what a garage makeover can do for you. 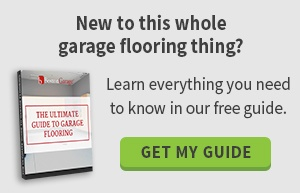 Garage floor coating is one of the most popular ways to give your garage floor a surface that is easy to clean with a hose, allowing you to remove all the outdoor things that seem to gather in corners. You can use a solid color that comes in shades to match the color scheme of your home’s exterior, and if you don’t like any of the standard colors, a custom color can be mixed for you. 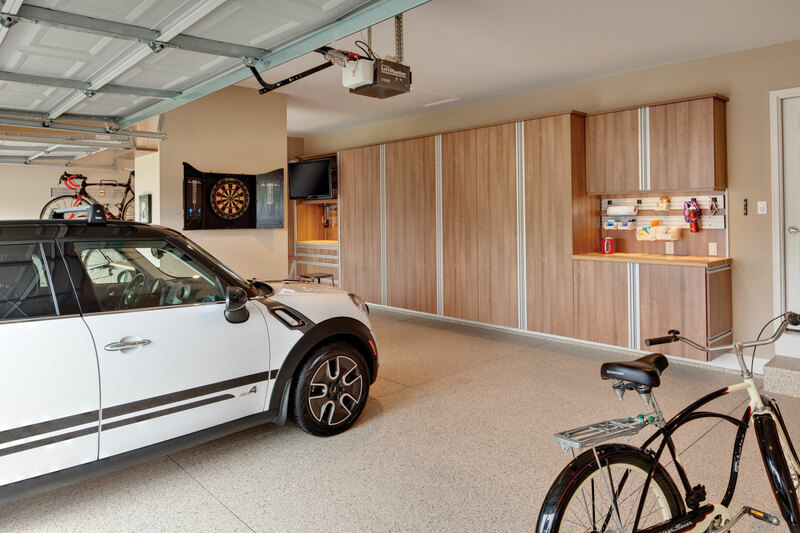 Another type of garage floor coating uses decorative chips that provide a textured look to the flooring and will remind you of quartz or granite. In addition, garage floor tiles are available to give your garage floor a different type of look. Garage cabinet designs are customized to your space to give you the look you want with the function you need. They’re made of commercial-grade products for durability and mounted off the floor for easy floor cleaning. Your cabinets will also be easy to clean and will look good, whether you prefer a clean white, grey or eggshell finish, beautiful wood grain or a metallic look. Choose accessories to complete your garage makeover, ranging from overhead storage, wall racks or bike racks. You make the garage useful and safe when you can remove the garage clutter and store things in the right place. Some homeowners opt for a large upright cabinet where they can store their artificial Christmas tree to avoid putting it together year after year! If you’re putting together a plan for a garage makeover, Boston Garage can help. Reorganizing your garage can be a big job, and we can help you with everything from a custom design to an on-location storage unit where you can protect the contents of the garage during installation. Don’t wait. Call us for more information, or request a free garage organization quote online today.